Putin, Assad, and Iran gain; Obama, Turkey, and Israel lose ground. Diplomacy has never witnessed anything like the dizzying and erratic sequence of events relating to Syria that began on Wednesday, Aug. 21 and ended 3½ weeks later, on Saturday, Sept. 14. Who won, who lost? It's too soon for a definite answer, but Bashar al-Assad is in the driver's seat, suggesting that he, Putin, and the mullahs will gain while Obama, Erdoğan, and Israel will lose. 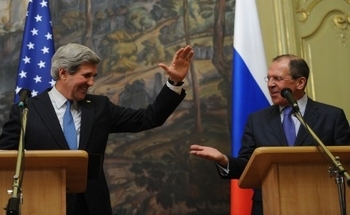 A pleased pair: U.S. Secretary of State John Kerry and Russian Foreign Minister Sergey Lavrov celebrate reaching an agreement. Aug. 21: A chemical attack took place against civilians in Ghouta, near Damascus, presumably carried out by Syria's Assad regime. Aug. 28: Barack Obama indicated an intent to use force against the Assad regime to punish it for the chemical attack. Aug. 31: Obama retreated and asked Congress for authorization to use force, something he did not have to do. Over the next week, in an unexpected development, popular and congressional opposition to a strike grew to the point that it became clear that Obama would not get the authorization he sought. Sept. 9: Secretary of State John Kerry promised an "unbelievably small" attack and off-handedly commented that international control of Syrian chemicals could obviate the need for an attack. The Russians picked up on and ran with the latter remark. Sept. 10: Obama rescinded the threat to attack the Syrian government and withdrew his request from Congress. Sept. 14: The U.S. and Russia governments signed the "Framework for Elimination of Syrian Chemical Weapons" to "ensure the destruction of the Syrian chemical weapons program (CW) in the soonest and safest manner." 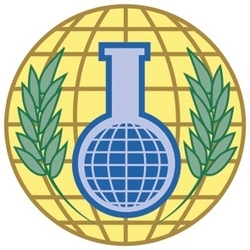 Logo of the Organisation for the Prohibition of Chemical Weapons, founded in 1997. Bashar al-Assad: The framework permits him to make the key decisions that drive the process, subject to the influence of his patrons (Moscow and Tehran) and his advisers (the Assad clan). He has two options, to comply or not to comply with the US-Russian framework and the demands of the Organisation for the Prohibition of Chemical Weapons, which regulates the chemical-weapons treaty Syria has promised to join. As a tactically incompetent leader, his actions are difficult to predict but I expect him not to comply because: (1) He needs these weapons to preserve his regime. (2) The civil war underway in Syria facilitates thwarting the OPCW. (3) Obama's record suggests he won't strike in retaliation. (4) Saddam Hussein set an appealing precedent, whereby Iraqi "cat and mouse" games slowed down and obstructed a similar regimen to destroy weapons of mass destruction in the 1990s. 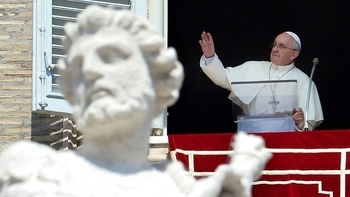 Pope Francis called for a global day of fasting and prayer for Syria. Barack Obama: Already in a corner because of his "red line" threat of August 2012, the U.S.-Russian agreement is a double-or-nothing gambit that places the American president at the mercy of his Syrian counterpart. If Assad complies, Obama becomes a foreign-policy genius for ridding Syria of chemical weapons without a shot. But if, as is far more likely, Assad does not comply, Obama must attack the regime to preserve his credibility, regardless of how much this runs contrary to the wishes of his leftist base and congressional opinion, the United Nations, the pope, et al., and even if it strengthens the jihadis in Syria and embroils the United States in an unwanted long-term military operation. I expect Obama will attack but without causing real damage to his own popularity or the Assad regime. Bashar al-Assad: He crows about surviving an American onslaught and is the stronger to this. Barack Obama: His foreign policy credibility sinks and that of the United States with him, especially vis-à-vis the Iranian nuclear buildup, at least until 2017. Vladimir Putin: Whether Assad complies or not, whether Obama attacks or not, the Russian president can't lose. Rather, he has become eligible for the Nobel Peace Prize. He is the big winner. Iran: Tehran gains, confident that its own nuclear infrastructure is safe from an American strike, unless Obama tears the Assad regime to bits. Recep Tayyip Erdoğan: The reverse: the Turkish president, as leader of the international war party, he loses unless Obama seriously attacks Assad. Israel: Along with Obama, Israel gains if Assad complies. But it loses if Assad does not, as is likely. We end with two ironies: The U.S.-Russian agreement does not solve the crisis, but delays and deepens it. Obama's almost nonchalant "red line" statement of a year ago was the obscure mistake that could precipitate the great foreign-policy fiasco of his presidency. Daniel Pipes is president of the Middle East Forum and author of three books on Syria. © 2013 by Daniel Pipes. All rights reserved.